I like to find new fun and useful gadgets. So I’ve scoured the net to find you of the best must-have kool accessories for your smartphone and tablet. 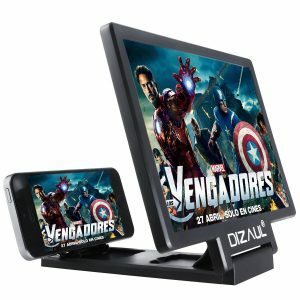 Every device on this list is very unique and practical and will be instantly desirable the moment I introduce you to them. If you need to secretly keep an eye on things at home whenever you’re not around. These seemingly innocuous gadgets look like a simple wall mount USB charger but if you look closely you will find a camera with 32GB of storage. 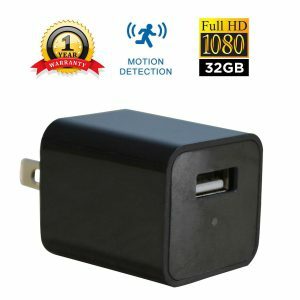 These cameras have 1080p high definition resolution and will start recording as soon as you plug into an electrical outlet or you set to motion detector and record when something moves. Whenever the memory is full to capacity it doesn’t stop recording it just records over the older files in the storage. They even record stereo sound quality so you will hear every word very clearly. To view your videos simply connect via USB cable to your computer and just download your files. This is a very very kool mini-drone similar to the Air Selfie drone but this is much cheaper. 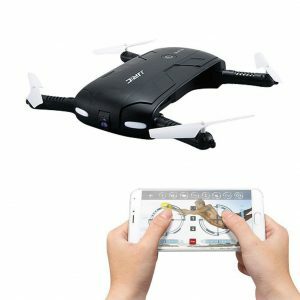 This little selfie drone is for those persons who want the perfect selfie from out of arm’s reach or from beyond the range of your selfie stick. The JJRC H37 is a great flying camera that takes pictures in HD. It folds up to the size of a cell phone and when you’re ready to use, just fold out its propeller arms and you’re ready to go. This mini-drone can hover anywhere you want in order to get the perfect shot. The be built in HD camera will transmit videos or still images in real time to your smartphone. Once you’ve got your perfect shot just simply land your selfie drone at the touch of a button. Then just fold it up and put it in your pocket. 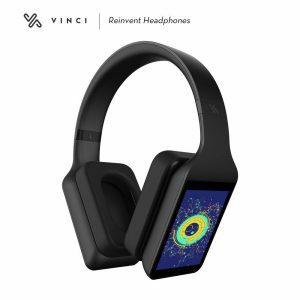 What makes the Vinci Smart Headphone so unique is the amazing and responsive touchscreen display on the side of the earcup. This Bluetooth headphone can operate stand alone without a smartphone and stream music via 3G network or WiFi to stream music from Amazon Music, Spotify, and Soundcloud. Vinci has its own voice assistant so you can say the song, artist, album, mood, genre that you want to hear or just ask the voice assistant to play a song for you and it also supports Amazon Alexa. You get 26 hours of Bluetooth playback and 7 hours of standalone music playback with 16GB of internal memory to store all your music. There’s a built-in sound recorder to record and playback voice recordings. Sound quality is very good no matter which music source of music streaming you use and these headphones will pause your music when removing them from your ear and plays automatically when there back on your ears. 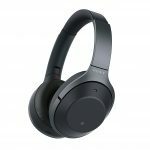 The Vinci Smart Headphone is a step forward in the headphone universe and is a bargain for the price. This nifty little gadget will stick on any flat or smooth surface. It has millions of tiny suction cups that creates a vacuum that makes it stick to flat surfaces from any angle. This rugged case allows you to adhere your iPhone to porous surfaces like tile, glass screen mirrors, whiteboard or cabinet walls. 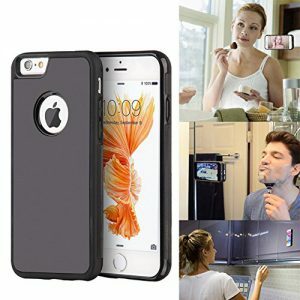 The nano-suction technology allows this case to securely support your phone’s weight and it’s very easy to remove from wherever you mount it without leaving any residue behind. So whether you’re taking a selfie, streaming videos or recording a vlog the anti-gravity case is a great way to stay hands-free to focus on other things. If you want to add some versatility to your smartphones limited onboard camera the Amir 3 piece lens makes it easy. The wide angle lens will catch a 180-degree field of view that your phone alone could never capture, the fisheye lens creates a visual distortion allowing for more panoramic hemispherical shots that just look kool. The macro lens allows you to get closer to your photos than you have ever been before revealing sharper details. 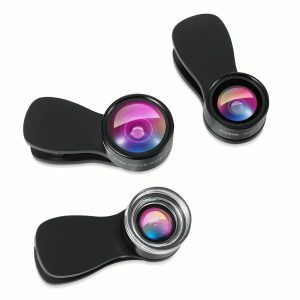 All 3 lens clip onto your phone, tablet or laptop camera. The Amir clip-on 3 piece lens helps you take your photography to a whole new level. 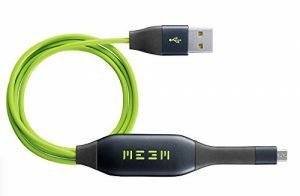 At first glance, this Meem Cable looks like your average charging cable with green and black aesthetics but this cable not only charges your phone but also automatically backs up all of your files every time you plug it in. Within 3 seconds of plugging your smartphone to the Meem cable it will start charging and the application will open up automatically and go thru all the file that have changed since the last time you plugged it in and download them unto the 64GB hard drive that’s built into the cable. This is a great way to backup your files on a regular basis and it’s also a simple way to transfer files from one phone to the next. Smartphones have taken watching movies out of your living room to bringing them anywhere we go. The downside is being limited to your phone’s small screen size and this could be a problem when it comes to eye fatigue. If you don’t have a projector to enhance your screen-size a Mobile Screen Magnifier is what you need. This Mobile Screen Magnifier will prevent eye fatigue by producing images 7 times larger than your smartphone screen alone is capable of. Just place your phone into the frame then just adjust the lens to the image size and angle you need without any additional power support. This multi-device keyboard is compatible with Android, iOS devices and Chrome, Mac and Windows computers. 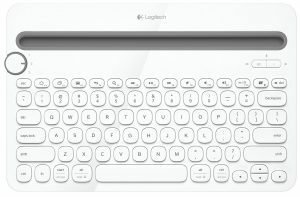 What makes the Logitech k480 wireless keyboard so unique is that you can pair it with 3 different devices simultaneously and to switch between each device just turn a knob on the keyboard. This keyboard is ideal for those who want one keyboard to use with multiple devices. Super Clean is a miraculous little putty that when rolled over objects can remove dirt impurities and completely disinfects them. Because of the way Super Clean works there are a lot of areas that it can reach, which very few other cleaning products can. 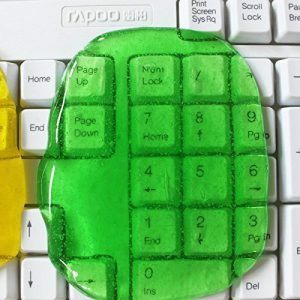 By simply rolling it over your keyboard a few times will bring your keyboard back like new. Super Clean doesn’t leave any residue at all and can be used many times while keeping your hands clean in the process. A Micro USB Card Reader will allow you to plug in either an SD or Micro SD card into a smartphone. 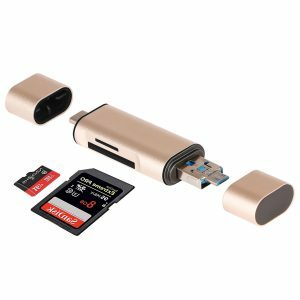 If your phone has a low amount of storage and doesn’t have microSD card functionality then having one of these SD card readers is a great way to expand your storage. You can get up to 256GB of extra storage and file are very easy to access. 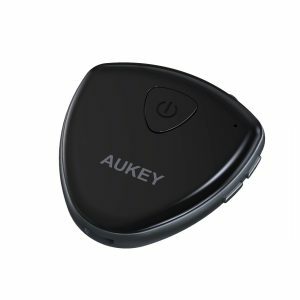 This awesome device is great for those that have non- Bluetooth TVs, audio system or even a car radio and want to listen there music wirelessly via Bluetooth connectivity. Just plug this small transmitter in via the AUX port of your TV or radio and you can stream music from your Bluetooth enabled phone or tablet. You can also stream from a non-Bluetooth device to a wireless headphone or Bluetooth speaker. This device will come in handy especially for all those with no Bluetooth radio in there car. 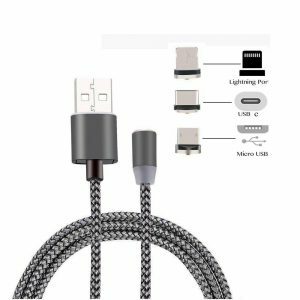 Setting up a Magnetic Charging Cable to your smartphone is pretty simple as plugging in the magnetic piece into your smartphones charging port. Once you’ve done that the magnetism is going to prevent you from ever missing or accidentally damaging your charging port and there also a LED indicator. One of the best things about a magnetic charging cable is that if your device is charging and someone walks past and tugs on the cable, instead of pulling the phone and potentially dropping it on a hard surface, all that will happen is that the cable will come out. 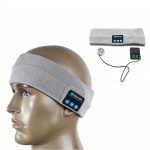 I hope you enjoy these fun and kool gadgets if you have any kool gadgets of your please share or if you have any questions about these or any gadget please comment below.